This “V” Series trophy will help your deserving basketball team celebrate victory! This outstanding trophy design is a silvery gray in color with gold detailing, and features a female basketball player mid-play with a basketball in hand. Celebrate success, encourage passion for the sport and share team spirit with this great trophy! 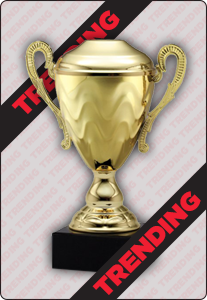 Engrave this trophy with a special message, event details or your team motto.